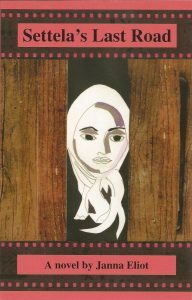 ‘The girl with the headscarf’ was identified by Dutch journalist Aad Wagenaar in the early 1990s as Sinti girl Anna Maria ‘Settela’ Steinbach. Here, Rainer Schulze, Professor of Modern European History at the University of Essex, shares her story. Europe’s Roma and Sinti were targeted by the Nazis for total destruction: upward of 220,000 were murdered or died as a result of starvation or disease. Many more were imprisoned, used as forced labour or subjected to forced sterilisation and medical experimentation. In the early 1990s Roma scholar and activist Ian Hancock introduced the term Porajmos (also spelt Porrajmos), meaning ‘devouring’ or ‘destruction’ in some dialects of the Romani language Romanes, for the persecution of the Roma and Sinti during the Nazi period. 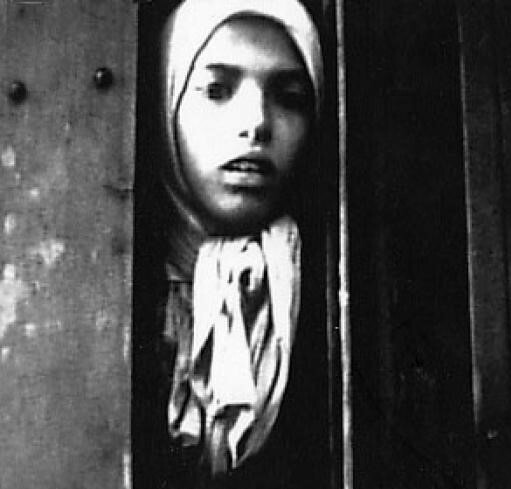 Many people interested in the Holocaust will have come across the image of a girl with a headscarf peering out of a half-open sliding door of a cattle waggon before the train departs for Auschwitz. 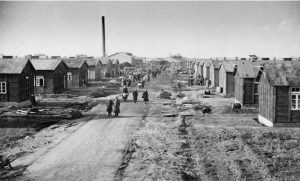 It was taken in May 1944 in the Westerbork transit camp in the north-east of the Netherlands, where Dutch Jews were held before they were deported to the extermination camps in the east. In the Netherlands the image is as famous as the picture of Anne Frank. In fact, far beyond the Netherlands, this haunting image of a young, innocent, vulnerable girl transported to her death has become a symbol of Jewish victimhood. For decades she was just known as ‘the girl with the headscarf’, and it was taken for granted that she was Jewish. It took the painstaking detective work of Dutch journalist Aad Wagenaar in the early 1990s to establish who the girl really was. His research led to an astonishing result: the girl was not Jewish but in fact a nine-year-old Dutch Romani girl by the name of Anna Maria ‘Settela’ Steinbach. Settela was born on 23 December 1934 into a traditional Sinti family in Buchten in the south-east of the Netherlands, where the family had put up their caravan for the winter months in what was known as ‘the Gypsy encampment’. The local doctor’s wife, Anna Maria Druysens, invited the Sinti every year to her house for Christmas. When she heard of the birth, she agreed to be the godmother for the newborn child, which is how Settela got her official name, Anna Maria. Settela’s father worked as a trader and a violinist in a Sinti orchestra at village festivals and fairs. Her mother ran the household and raised the children, seven altogether, while moving from village to village. The family had originally come from Germany, and they would no doubt have heard about the worsening situation of the Sinti and Roma since the Nazis had come to power. In May 1940, the Nazis occupied the Netherlands, but initially did not target the Sinti and Roma. It was only in July 1943 that an order was issued prohibiting them from travelling by waggon, and all Sinti and Roma were forced into one of 27 guarded assembly camps. The Steinbach family tried to evade the order, but eventually were deported to the central assembly camp in Eindhoven. Settela’s father Heinrich ‘Moeselman’ was picked up by the police from there. He survived the war and died in 1946. Altogether 574 ‘gypsies’ ended up at Westerbork. However, on further inspection by the camp authorities more than half of them turned out to be either not Roma even though they lived in waggons, or they had foreign passports, and they were therefore released from the camp. The remaining 245 Sinti and Roma were put on a cattle train and deported to Auschwitz-Birkenau on 19 May 1944. Upon arrival, they were taken to the Auschwitz Gypsy Family Camp. Those regarded as fit enough to work were later transported to labour camps. Settela and the rest of her remaining family were murdered in the gas chambers of Auschwitz, probably during the night of 2 August when the Auschwitz Gypsy Family Camp was liquidated. In contrast to Anne Frank, who left us her diary, Settela did not leave us anything apart from this one haunting image – a few fleeting seconds in a film about Westerbork transit camp. Millions of people have been moved by this image without realising who this girl was. 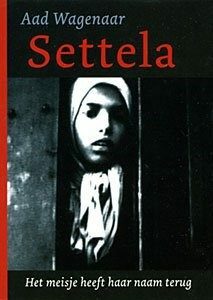 In 2008, Janna Eliot, a Roma writer and musician from London, published a book about Settela, based on Aad Wagenaar’s research: Settela’s Last Road. Eliot tried to create a diary-like narrative of Settela’s final months and put her imagined thoughts, her fears and her dreams of leading her people to freedom into words. Many reviewers agreed that this is an inspirational book that should be read in schools next to Anne Frank’s diary. Despite Eliot’s efforts, the book remains widely unknown – another indication that there is still a long way to go until the fate of the Roma and Sinti during the Nazi period is fully appreciated and recognised. Professor Schulze wrote a series of nine blogs for the Holocaust Memorial Day Trust for Gypsy Roma Traveller History month. You can read them here.